Valcourt, Canada (11/12/2008) - A three-man team consisting of Cliff Beasley, Richard Cecco and Michael Swift won the Pro Utility class by more than 15 minutes at the GBC Heartland Challenge endurance race near Carlisle, Iowa. 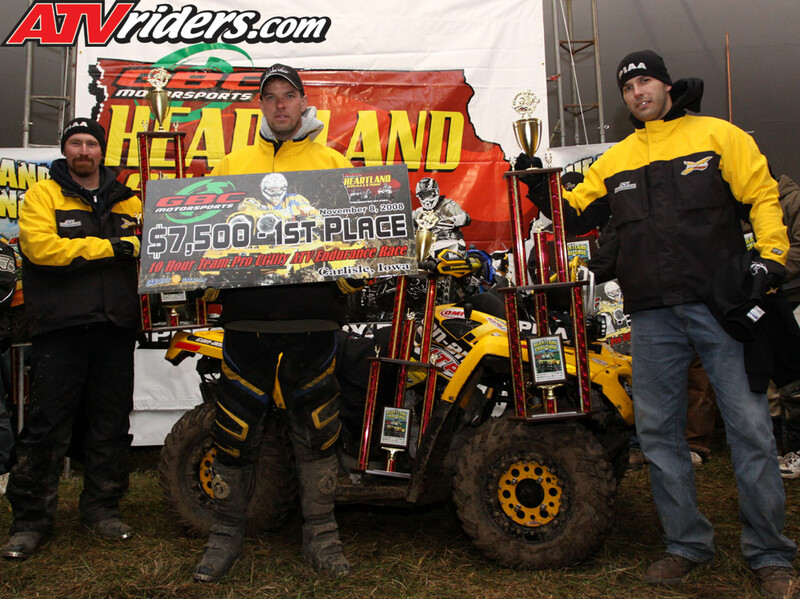 The team piloted its PIAA Powersport Can-AmTM OutlanderTM 800R ATV to the class championship and ninth overall in the gruelling 10-hour race that proved only the toughest utility ATVs would survive the course. "Endurance ATV racing is the ultimate test for both rider and machine," said Del Bohlman, Racing Manager for Can-Am ATVs at BRP. "The three racers all rode a smart race, but the Outlander proved its durability by beating the next closest class competitor easily. 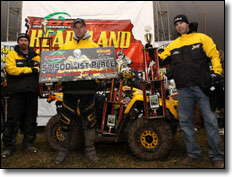 This is a big win for Can-Am and proves we have toughest utility ATV in racing." The racers will each split a grand prize of $7,500 for the race win, making it the most lucrative utility-class purse in ATV racing to date. Beasley, Cecco and Swift are all teammates from the Team Warnert Racing / Can-Am Grand National Cross Country race team. Both Swift and Beasley winning the GNCC 4x4 Limited and 4x4 Lites class respectively. Cecco took third in the GNCC U2 class with five class podiums in 2008. Bombardier Recreational Products Inc. (BRP), a privately-held company, is a world leader in the design, development, manufacturing, distribution and marketing of motorized recreational vehicles. Its portfolio of brands and products includes: Ski Doo® and Lynx™ snowmobiles, Sea Doo® watercraft and sport boats, Johnson® and Evinrude® outboard engines, direct injection technologies such as Evinrude E TEC®, Can Am™ all-terrain vehicles, Rotax® engines and karts.